The Quays covers the three areas of Salford Quays, Trafford Wharf, and Old Trafford around the Manchester Ship Canal. These former docks have been completely redeveloped and will soon be home to a large portion of the BBC, creating one of the biggest media cities around. Instructions and times for reaching The Quays from anywhere in Manchester are available from www.gmpte.com. From the North: From M60, take J12 for M602. Follow signs from the end of the M602 for Salford Quays. From the South: From M60, take J7 onto A56 Chester Road. Follow signs from here for Salford Quays. Reachable by the metro tram system from central Manchester, get a tram (line M2) heading to Eccles and disembark at either Exchange Quay, Salford Quays, Anchorage, Harbour City (for the Imperial War Museum North) or MediaCityUK. See www.gmpte.com for more details. Number 69 buses will bring you to the Quays. They operate hourly between Mon-Sat 8AM-6PM. See www.gmpte.com for more details. See the magnificent bridge across one of the pools linking Salford and Trafford. Old Trafford (Manchester United's stadium) is just off Salford Quays. The award winning architecture. The Quays have been blessed with bold, contemporary yet tasteful buildings. Imperial War Museum. (free admission). The Imperial War Museum in London contains tanks, guns, planes, and uniforms to delight all visitors. The Northern experience is full of videos of old people talking about rationing. 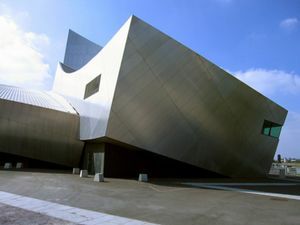 The building itself, however, is visually very striking, so combine it with a trip to the Lowry for a feel of modern architecture. 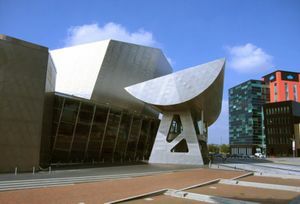 The Lowry . This is an art gallery and very modern theatre. The gallery contains an impressive selection of works including, unsurprisingly, a large selection of works by L.S. Lowry. The building is very modern and was designed to encourage exploration (according to the architect). He made the building widen and deepen from the entrance and refused to have any signs for the toilets! It's also in Salford, but don't let that worry you. Use the tram, about fifteen minutes out from the city center. The Manchester United Museum, located in the large North Stand of Old Trafford football stadium. This museum details the history of Manchester United from the very early days when they were known as Newton Heath through the golden era in the 60's when the team was known as the Busby Babes and won the European Cup. You can also explore the United history from the second golden era in the 90's when players like Beckham, Cantona, Giggs, and Schmeichel glittered an all-conquering team up to the present day when you have stars like Rooney, Ronaldo, and Van Nistelrooy all wearing the famous red top. Well worth a visit for fan and non-fan alike. If you go on a day when United are not playing at home, you will also get to go on a free stadium tour (the highlight of any fan's trip!) which takes you into the changing rooms, the dugout, and also the directors' box. BBC Studios tour . Tickets for tours of the BBC studios at MediaCityUK (next to the Lowry at Salford Quays) must be bought in advance through the BBC website. Home to BBC programmes including Match Of The Day, Blue Peter, A Question Of Sport, Mastermind, BBC Breakfast and Radio 5 Live. Tours take place on Mondays, Tuesdays and Wednesdays at 10.30, 12.30 and 15.00; and on Saturdays and Sundays. The Lowry Outlet Mall  offering reduced prices on brand name products all-year round. The Trafford Centre  is a bit further out from the Quays, but it will satisfy all your shopping needs for the next year or so! The Manchester United Superstore, Sir Matt Busby Way (the other side of the Manchester Ship Canal)  is a good place to stock up on anything you could possibly want Man United wise! Just don't expect any bargains. Cafe Rouge. Overlooking the Lowry in the outlet mall.There is also an outside terrace. Pizza Express located in the base of the Lowry Outlet Mall, facing the Lowry Gallery. Your usual high quality pizzas are available here. Frankie and Bennys by the Salford Quays tram stop. The Lowry. The restaurant is excellent with very attentive service and an outside terrace overlooking The Imperial War Museum North. Imperial War Museum North. The cafe has good view of The Lowry and MediaCityUK. Wagamama. Japanese restaurant on the ground floor of the ITV building at MediaCityUK (next to the Lowry). Damson. Up market restaurant in the University of Salford building at MediaCityUK. Pokusevski’s deli cafe on the ground floor of the BBC's Bridge House, MediaCityUK. Comfortable, contemporary hotel with complimentary hot breakfast, air conditioning and free public area WiFi. Ramada Salford Quays, 17 Trafford Road, tel: 0161 876 5305 (email: [email protected] )  Located in the heart of Salford Quays within walking distance of Old Trafford and Media City. Remember this hotel is just over the river Irwell from Manchester city centre AND NOT at The Quays! This page was last edited on 12 August 2016, at 13:56.